The party cake with the STCC Great Ideas Logo beginning to disappear. 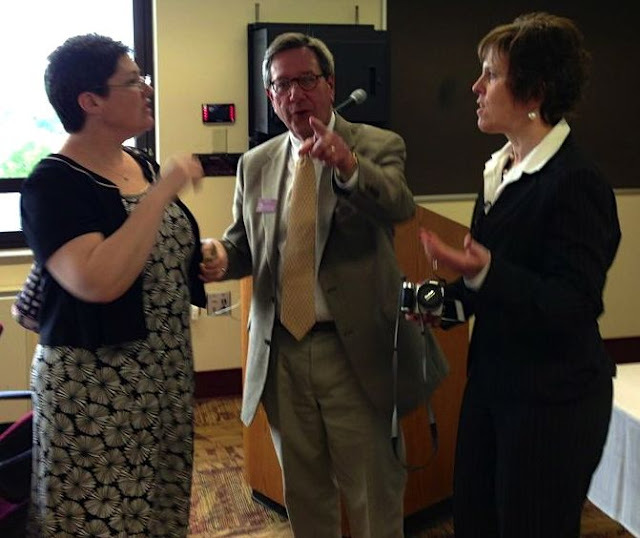 Left to Right: Joan Nadeau, Mike Suzor and Joan Thomas. These three along with Art Fish, Kamari Collins, Joe DaSilva, Bonnie MacKay, Mary Ann Payeaur and Liz Almeida make up the Great Ideas Steering Committee. 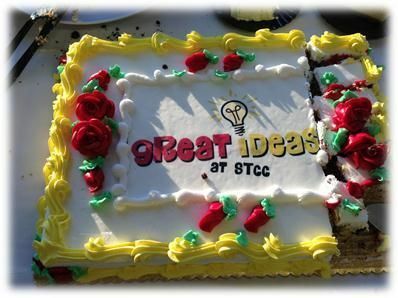 Great Ideas, the ideas system at STCC, celebrated its second anniversary on May 14 with over 100 STCC staff attending. Since inception, the project has resulted in over 1000 ideas implemented with 30 college departments participating. To learn more go the STCC Great Ideas website. By Melinda Mechur Karp, published by the Community College Research Center at Columbia University. The study by Melinda Karp reviews the ways that community colleges assist students in choosing a career. This paper follows on the heels of the important work, Get with the Program: Accelerating CommunityCollege Students’ Entry into and Completion of Programs of Study by Davis Jenkins and Sung-Woo Cho. The Jenkins/Cho research also from the Community College Research Center of Columbia University concludes that community college students who select a career early in their college studies are more likely to persist and graduate. Thus one now popular strategy to increase graduation rates at community colleges is to focus on career development. The last and most recent report by The Century Foundation looks at community colleges nationally examines community college funding in relation to socioeconomic- and race/ethnicity-based achievement gaps. The report argues, “Two-year colleges are asked to educate those students with the greatest needs, using the least funds, and in increasingly separate and unequal institutions.” Although this is something those who work in community colleges have known for a long time, it is finally beginning to receive wide attention. I’ll have more to say about Bridging the Higher Education Divide in another blog.